I was looking through my kitchen and found a lovely jar of clams I got from an Italian supermarket a little while ago.. So I thought of making this so simple yet very yummy pasta delicacy..
Start cooking your pasta al dente.. 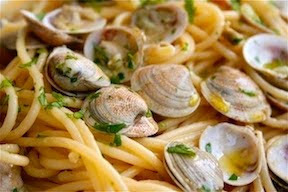 In the meantime, add a generous amount of olive oil in a hot pan and cook for a minute or so on medium heat.. Add the clams, lemon juice and increase the heat to high.. Swirl them around a little then add the white wine and cook for a few minutes.. Season with pepper and salt (if needed) and toss in the pasta bit by bit.. Now add the pasta water to thicken the sauce and let it all cook together for another minute.. Take the pan off the heat, sprinkle with parsley and toss to combine everything.. Drizzle with a little olive oil or my preference, homemade spicy oil, and serve immediately.. Enjoy!